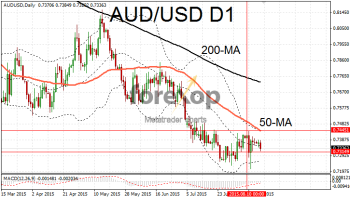 The Australian dollar was under pressure again following a selloff in Chinese equities. The Shanghai composite dropped a further six percent on Tuesday – adding to the fall of over thirty percent that’s taken place since the summer. The latest move has fuelled speculation that Chinese authorities will act more aggressively to devalue the yuan. Australia’s decade long mining boom has been underpinned by the surging Chinese economy. A slowdown in the Asian power house is being felt sharply as the Australian economy becomes accustomed to the slower growth. Crude oil held steady at US$48 but industrial metals came under heavy selling pressure. Australia’s central bank (Reserve Bank Australia) released the minutes of the last meeting today. However the meeting took place before the latest currency market intervention by the Chinese Authorities and so didn’t reflect an up to date assessment. 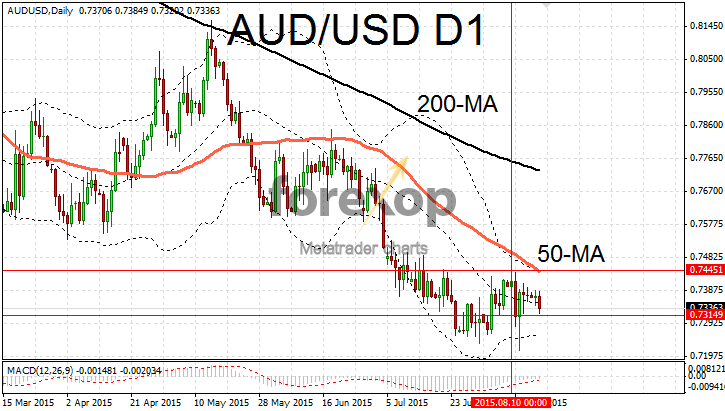 AUD/USD saw its biggest fall in over one week dropping back to 0.7330. The pair continues to progress in a bearish downtrend. Fundamental headwinds on the Aussie dollar look set to prevent a significant rebound any time soon. Also in bearish mood AUD/JPY was trading down to 91.18. The yen was benefiting from risk aversion amid the uncertainty surrounding events in China. A raft of economic data on the Japanese economy is due for release later today. The trade balance is due together with a survey of leading business indicators. Yen also remained supported against the greenback with a push down to 124.36. USD/CAD has been relatively well supported among the commodity currencies. The pair dropped to 1.3070 today despite the stronger dollar. Traders are positioning defensively ahead of a wave of data on the US economy which is out on Wednesday. Consumer inflation will be an important release and is expected to show that prices excluding food and energy increased by 0.2% in July. This will put the annual pace at 1.8% to July. A disappointment either way will likely cause a large correction across dollar pairs. The FOMC is also due to release the minutes of their last meeting. Traders will be scrutinizing the contents for any hints that September will indeed by the point at which the Fed starts to raise rates as is widely anticipated.